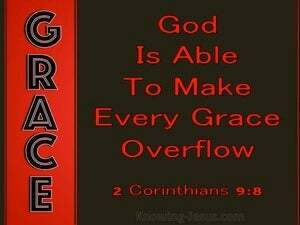 ﻿ 2 Corinthians 9:8 And God is able to make all grace abound to you, that you, always having all sufficiency in everything, may abound to every good work. 7 Let each man give according as he has determined in his heart; not grudgingly, or under compulsion; for God loves a cheerful giver. 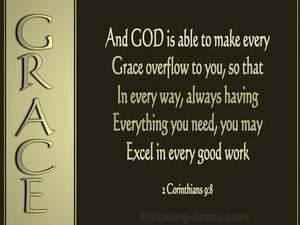 8 And God is able to make all grace abound to you, that you, always having all sufficiency in everything, may abound to every good work. 9 As it is written, "He has scattered abroad, he has given to the poor. His righteousness remains forever." Both riches and honor come from you, and you rule over all; and in your hand is power and might; and it is in your hand to make great, and to give strength to all. Amaziah said to the man of God, "But what shall we do for the hundred talents which I have given to the army of Israel?" 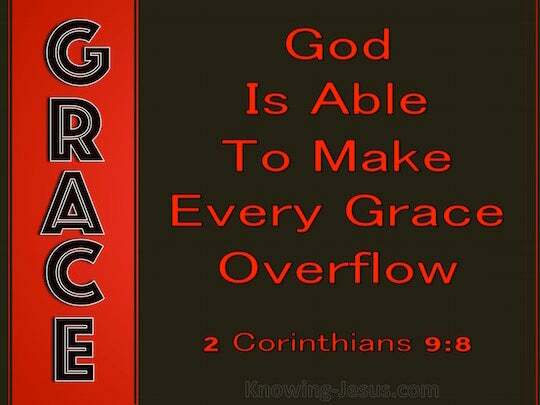 The man of God answered, "Yahweh is able to give you much more than this." There is one who scatters, and increases yet more. There is one who withholds more than is appropriate, but gains poverty. how that in much proof of affliction the abundance of their joy and their deep poverty abounded to the riches of their liberality. Not only so, but who was also appointed by the assemblies to travel with us in this grace, which is served by us to the glory of the Lord himself, and to show our readiness. But I have all things, and abound. I am filled, having received from Epaphroditus the things that came from you, a sweet-smelling fragrance, an acceptable and well-pleasing sacrifice to God. Let our people also learn to maintain good works for necessary uses, that they may not be unfruitful. you being enriched in everything to all liberality, which works through us thanksgiving to God. For Yahweh God is a sun and a shield. 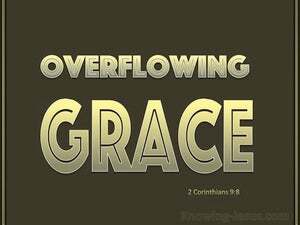 Yahweh will give grace and glory. He withholds no good thing from those who walk blamelessly. Therefore, my beloved brothers, be steadfast, immovable, always abounding in the Lord's work, because you know that your labor is not in vain in the Lord. For we are his workmanship, created in Christ Jesus for good works, which God prepared before that we would walk in them. comfort your hearts and establish you in every good work and word. who gave himself for us, that he might redeem us from all iniquity, and purify for himself a people for his own possession, zealous for good works.